Simon & Schuster, 9781451685879, 208pp. 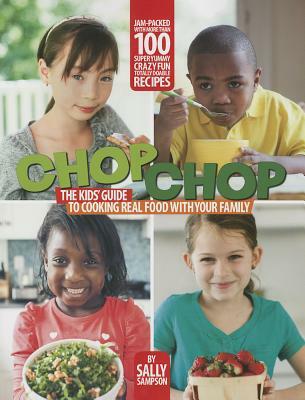 Winner of the International Association of Culinary Professionals Cookbook Award in the Children/Youth/Family category, ChopChop offers simple, healthy, and delicious dishes for children and parents to make together. Cooking at home helps kids stay healthy, builds family relationships, and teaches math, science, and cultural and financial literacy. That’s why ChopChop is your family’s best friend—and it’s jam-packed with kitchen basics, ingenious tips, and meals that taste great and are fun to make. Every recipe has been approved by the Academy of American Pediatrics and by real kids cooking at home. These dishes are nutritious, ethnically diverse, inexpensive, and a joy to prepare. From French toast to fajitas, and from burgers to brownies, ChopChop entertains and inspires cooks of all ages. Sally Sampson is the founder of ChopChop magazine and the author and coauthor of numerous cookbooks, including the James Beard Award-nominated The $50 Dinner Party, Throw Me a Bone (with Cooper Gillespie), and The Olives Table (with Todd English). She has contributed to Self, Bon Appétit, Food & Wine, The Atlantic, The Boston Globe, and The Boston Phoenix. She lives with her family in Watertown, Massachusetts. "Sampson has solved a puzzle everyone talks about—how to make children and families cook—by being truly cross-cultural, practical, explicit, and never patronizing." "A delicious standout title, sure to inspire the next generation of chefs."